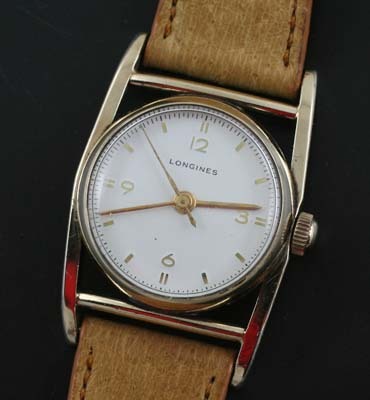 One of the more unusual Longines watches with a rail frame surrounding the round face. Vintage model with manual wind movement. A most unusual case on this vintage Longines. 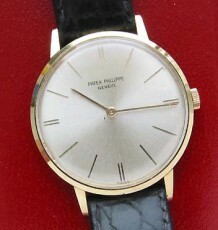 The round case surrounds the dial and then is enclosed in a barrel shaped frame. 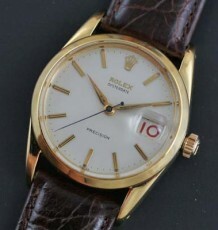 The dial has a white background with gold applied Arabic numerals at the 3, 6, 9 and 12 o’clock markers. Many watch collectors are familiar with the Longines brand and some of the many famous vintage watches they have made over the years. 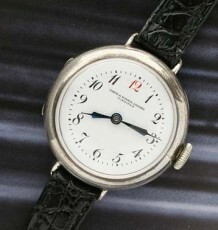 Some of the most notable were the Longines Lindbergh and the Longines Legend divers watch. The watch uses a manual wind 16 jewel Longines 10L calibre. The watch was just serviced by my watchmaker and in running well. The unusual case measures 27.5 mm wide by 39 mm long and is signed Wadsworth 10 karat gold-filled.